Delving into the deep, dark corners of the internet yields some useful intelligence – no, not the dark web, but rather the back side of NTCA-managed websites. Here, using analytics software, plugs-ins, and other virtual gadgets, it’s evident there’s considerable interest in information about hollow-sounding tile as well as the sometimes related topic of spot bonding. 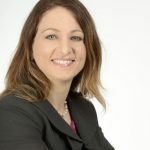 It’s no surprise; the contributing factors for both have been on the rise, prompting articles, white papers, and revisions to industry standards over the last several years. This article is being added to the collection to give an overview and to generate member discussion online about these not-always-black-and-white topics. 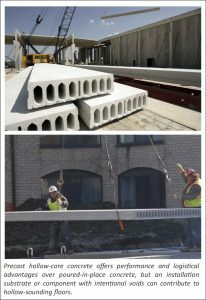 an installation substrate or component with intentional voids – for example, some uncoupling membranes and hollow-core concrete slabs. As flooring materials go, ceramic is more of a transmitter, so hollowness will typically be more obvious, whatever the cause. Because spot bonding leaves larger voids under the tile, cracked tile over voids is a typical observation. Spot-bonded tile is also generally not as well-bonded to a substrate so loose/debonded tile could also occur. However, while workmanship may be an obvious cause of hollow sounds and tile and grout issues, it may not be the only cause. A thorough inspection is required to discern. A 2013 TileLetter article, well before the TCNA Handbook revision was made, outlined a process of removing tiles and substrate from various areas of a hollow-sounding floor to determine whether tiles have debonded. It also addressed why and whether individual tile replacement or entire installation replacement might be needed. The subsequently-added TCNA Handbook language suggests a more conservative wait-and-see approach: no action necessary in the absence of actual issues. A destructive inspection will require repairs resulting from the inspection itself at the very least, and could cause new debonding or weakening of bonds. This might necessitate later repairs that would not have been needed had a destructive inspection not been performed. Furthermore, a premature destructive inspection muddies the waters with regard to the reason or responsibility for later repairs, should such be needed. Accordingly, the physician’s “first, do no harm” guideline may be advisable. The installation itself will, over time, relay its soundness and reliability. In other words, when tile or grout issues do appear, the tile contractor should be consulted first and any governing workmanship requirements for the project should be scrutinized in order to distinguish installation concerns that don’t meet them from those that do. An inspection may be in order if working with the contractor doesn’t remedy issues, or to explore if other conditions outside the tile contractor’s control are also factors. This is no defense for spot bonding or poor workmanship, but rather a caution about fast, easy conclusions. Too often tile contractors are the only target when things go wrong, perhaps because the installer’s work is easily observable and photographed, comparatively inexpensive to evaluate, and fairly basic to comprehend: a handy smoking gun. 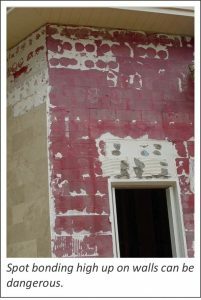 A more thorough assessment (e.g., structural evaluations, laboratory testing of concrete, etc.) will be significantly more expensive, more difficult to arrange because of the scarcity of people who can conduct a specialized study, and the results are often more complex even though more accurate. Generally, such exhaustive research will not be undertaken over some broken or missing tiles, let alone just a hollow sound. In the field of statistics, terms like missing data bias and omitted-variable bias refer to the inaccuracy of a conclusion resulting from leaving out relevant variables or information. Specifically, conclusions will overestimate the effect of the variables and information that were included. There’s also confirmation bias, which makes it difficult for people to interpret information objectively, particularly when something significant is at stake. It’s a cognitive phenomenon that makes it equally challenging for the tile contractor, product rep, building designer, etc., to believe negative information about their work or product. 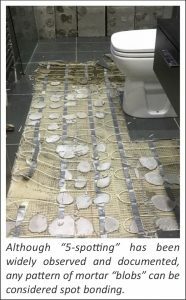 To avoid faulty conclusions about tile installations when complete research will not be commissioned, those weighing in on installation issues can provide fairer assessments by making a point to include known biases. For example, they can list information and relevant variables that have not been factored in. This is the case for any tile-related issue being assessed but is especially relevant to hollow-sounding tile and tile with less-than-ideal mortar coverage. 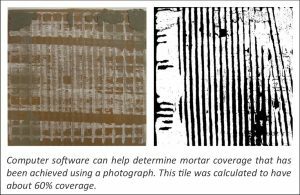 The ease of “sounding” a floor to find hollow sounds or photographing tiles with poor mortar coverage makes these issues popular subjects of reports that inaccurately paint the picture that only the tilework is subpar. In addition to more field information, what about looking into compressed schedules and decisions made in the course of construction? 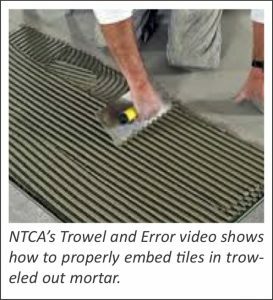 An NTCA bulletin (https://bit.ly/2N7G76H) makes the point that sometimes the practice of spot bonding is less about unskilled installers than it is about designs that require flat substrates and reasonable schedules that – when the time comes – aren’t provided. For example, general contractors often refuse to pay to flatten an out-of-tolerance substrate. Is it reasonable then, when substrate requirements are actively disregarded, to expect the various workmanship standards predicated on substrate flatness to be met? There can be many answers and approaches to such philosophical questions with no single right answer. “What went wrong?” is a less subjective question. But the answer is only accurate when conclusion bias is specifically avoided by seeking out and including all relevant information. For those searching on “hollow sounding floors” or “spot bonding,” hopefully this article provides a heightened understanding of the complexities around two topics that are often oversimplified. With regard to spot bonding in particular, tile contractors cannot routinely absorb costs to provide installation conditions they need and expect, based on project documents. However, the legal/contractual issues, safety considerations, and workmanship standards don’t dissolve just because proper conditions aren’t provided, including when there is abject refusal to provide them. In fact, because spot bonding introduces just as many (or more) issues than it fixes, NTCA workshops and other educational efforts focus heavily on mortar coverage requirements and the many reasons spot bonding is never recommended and is in no way condoned by NTCA. While industry standards and association resources can relay unambiguously various “do’s and don’ts,” they cannot so easily prescribe the best path for tile contractors confronted with perfect-world versus real-world issues. What works well for one company or project may not work at all for another. That’s why a core benefit of NTCA membership is the opportunity to dialog with and learn from other members when it comes to the many unavoidable gray areas and business decisions that must be made. NTCA members: What do you or other contractors you know do in this scenario? Or what should tile contractors do? What works and what doesn’t? Can the issue be better addressed by industry standards? Share your experiences and ideas on the “NTCA Members Only” Facebook group. Stephanie Samulski is NTCA Director of Technical Services. Her tile career began in 1999 as a tile layer apprentice with BAC Local 32 in Detroit, where she worked mainly on commercial installations for Shores Tile Co. A former project manager for the Tile Council of North America (TCNA) and the Ceramic Tile Education Foundation (CTEF), Sunulski has worked on industry standards as well as knowledge and installation curricula for training and certification programs.